The IT Band is a running mystery. A frequently experienced injury, many runners don’t know what it does. The illiotibial band (ITB) is a large fibrous group of fascia that runs longitudinally down the outside of the upper leg. Anchoring at the iliac crest and tibia, it’s a bunch of passive rubber bands that extend, abduct and rotate the hip laterally. It also helps stabilize the knee while storing energy to support running and walking. IT Band syndrome (ITBS) is an inflammation of these tissues and typically presents with outer knee pain. That is the area where the ITB should slide over bone and muscle easily. If it’s not sliding due to inflammation or tightness, pain will result. Sometimes the pain can be felt along the entire length of the outer thigh and it’s often a result of overuse. Two examples of exercise patterns that can lead to overuse are increasing mileage too quickly or adding lots of plyometrics. There is good news, however. There are several ways to treat and prevent ITBS. The first step in treatment is to rest long enough for the inflammation to subside. Second is to work on improving mobility of the hip and knee. Limited range of motion in either joint can cause extra stress to the ITB and lead to inflammation. Foam rolling and proper warm up to increase circulation to these fibers before a workout will help it slide painlessly. Strength training with a qualified coach is one of the best solutions to ITBS. Having muscles strong enough the support your increase in mileage or the strain of a downhill marathon will help prevent ITB irritation. Hip, glute and abdonimal core strength are paramount to any solid strength training plan for runners who want to stay healthy. These muscles also ensure your IT band gets the support it needs. A final possibility is that it might not be it your IT Band at all. The ITB is so passive it’s hard to know how it might get injured. Since that research isn’t ready yet take a look at the muscles around it: your hamstrings and quads. When these muscles get tight or damaged they can put stress on the IT band. Relaxing the tight muscles through improved mobility or foam rolling can release stress on the ITB to reduce or eliminate pain. Want to stay ITBS free? Take good care of all the muscles it works with. Be sure to strengthen, stretch and warm up properly. This entry was posted in Injury, Racing, Running, Strength Training and tagged foam rolling, injury, injury prevention, marathon training, running form, running injury on April 8, 2019 by Coach Meredith. Plantar fasciitis is a nasty and common running injury. A seriously no fun thing to face, PF is something all runners dread but luckily, it is 100% preventable. Learn more about what PF is, how it happens and how to treat it by reading on! What: Plantar fasciitis (PF) is the most common source of heel pain in runners new and old. It is the result of inflammation in the thick band of tissue that connects your heel bone to the rest of your foot. Cause: PF is cause by inflammation of the plantar fascia as it rounds the heel bone. These tissues, the plantar fascia, are a support for the arch of your foot and act like a shock absorber when the foot lands. If they become overworked, the results are inflammation and tenderness. Drastically increasing mileage and worn out shoes are common causes. People who are overweight, who have weak feet, poor movement mechanics or wear shoes without enough support are especially at risk. Symptoms: Plantar fasciitis is characterized by a sharp stabbing pain in the foot with the first movements of your day. The pain will then usually subside or ease once the foot has warmed up. PF pain can resume when you stand for a long period of time or when you stand up from sitting or lying down. This injury can limit the amount of running, jumping, walking and dancing you are able to tolerate. Treatments: Anti-inflammatories, rest and ice are good treatments. Orthotics and surgical options exist for those who have unbearable pain. Those paths should only be taken in very extreme cases of completely collapsed or permanently damaged plantar fascia. An important part of any treatment plan is determining the cause of your plantar fasciitis. Work with a physical therapist or certified coach to ensure you don’t become re-injured. Recovery: Prevention is the best way to treat PF. Be sure spending time barefoot, foam rolling and regular foot, ankle and lower leg strength and mobility exercises are part of your training plan. You’ll want to build stronger arches, more flexible ankles and looser Achilles tendons that are less likely to become inflamed during the recovery phase. If you do come down with plantar fasciitis, recovery can be a long road. Work with a coach or therapist to find the treatment plan that works best for you. This entry was posted in Injury, Running and tagged foot care, injury prevention, running, running injury on April 3, 2017 by Coach Meredith. Shin splints are an annoying injury that almost every runner faces at some point during their career. Whether you’re a 2:45 marathoner or 45 minute 5k racer, it’s one problem no one wants to face. Identified by throbbing shin bones when running, shin splints are a painful and hobbling nuisance. Luckily, once you’ve ruled out a stress fracture, the solution can oftentimes be a simple and easy one. Here are three simple fixes for shin splints that Team ECRP uses over and over again to keep runners moving. Test your shoelaces. Sometimes the quickest way to get to the root of your shin pain is to check the things on your feet. Connected to your ankle and therefore your shin bone, anything awry with your foot can lead to serious problems anywhere above it. How? Our feet flex to absorb impact every time we land, they move around to help us balance and are how power goes from our bodies to the ground. If our shoes are tied too tightly we take that away from them. 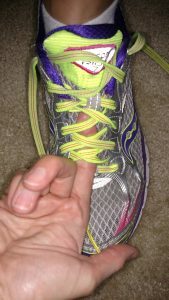 Fix: Make sure you can fit at least a finger under all of your laces except the top one. 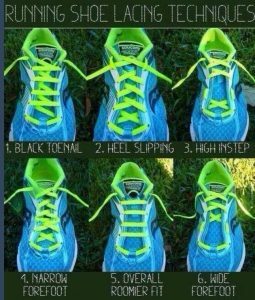 Try different lacing styles based on your foot type. Kicking those shin splints could be as simple as letting your feet do their jobs. Gait Analysis: OK, it’s not the laces. You tried loosening them and nothing changed. The next step is to have your gait checked out. Serious heel striking or over striding with a locked out ankle can send shock waves right up those fragile shin bones every single step. Have a qualified coach watch to help determine if the way you run could be causing your problem. Fix: Work towards shorter, softer steps. Not all heel striking is bad but all over striding is sure to cause some trouble. Film yourself and work with a coach to treat the source, not just the symptom. Strength Training: Since we always want to treat the source of an injury so it doesn’t happen again that gait analysis mentioned above is a key component of healing your hurting shins. Weak hips or poor posture can lead to lots of problems below the knee. Proper strength training will help prevent the overuse that typically leads to torn up shin muscles. Fix: Work with a coach or trainer to develop a plan that includes runner specific strength work and a gradual build up of mileage. A completely avoidable injury, shin splints won’t sideline you again when you use these tips. This entry was posted in Injury, Running, Strength Training and tagged injuries, recovery, running, running injury, training on October 31, 2016 by Coach Meredith.